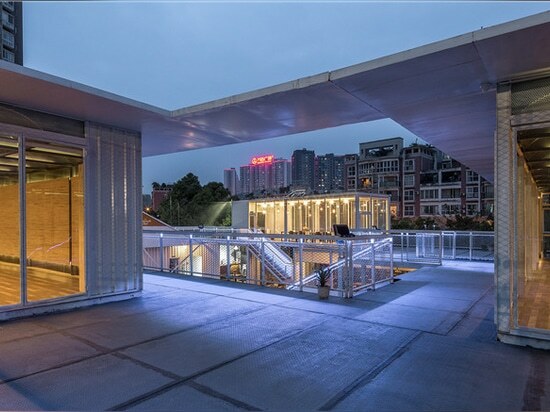 contrary to its name, the black box gym in china’s chengdu city is formed by a group of open white boxes. 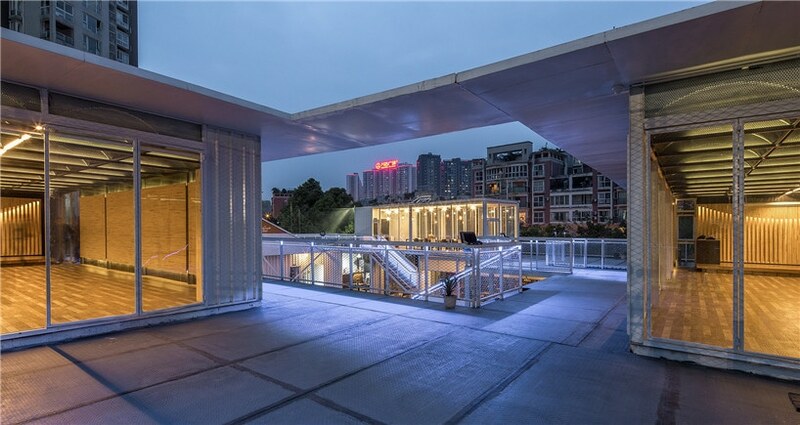 contrary to its name, the black box gym in china’s chengdu city is formed by a group of open white boxes. 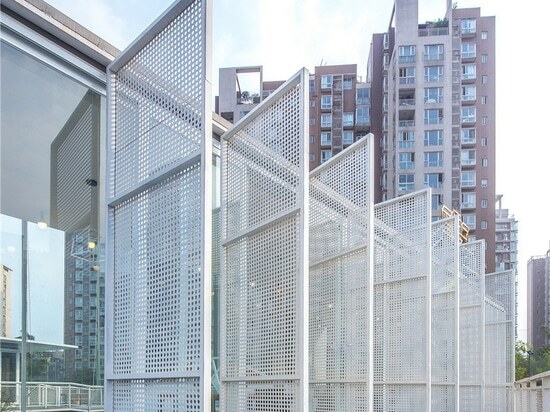 situated in an unused plot of land in an ageing urban community, the temporary building features a framework of beam-to-column corrugated steel and perforated steel plates to provide fitness facilities and recreational space for the local community. 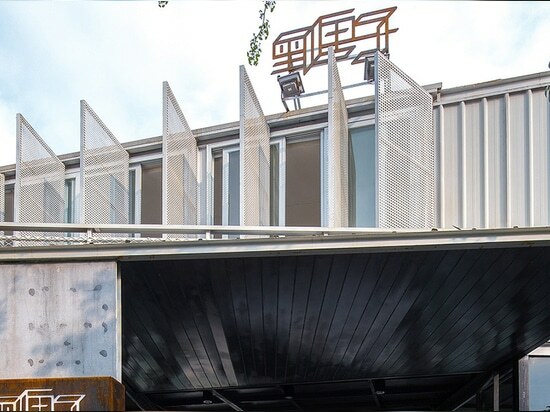 designed by epos architects in collaboration with horus architectural design (HAD), the low budget requirements of the client has resulted in a building constructed of rudimentary and raw materials: steel, wood and concrete define the project. the building itself is comprised of number of different programmatic typologies. 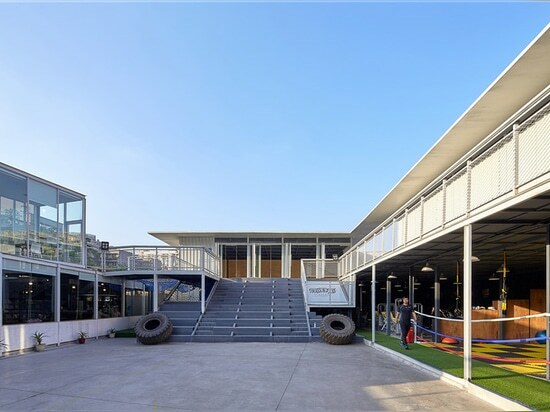 functioning mainly as a gym, the black box also houses room for recreational activities, art exhibitions, event spaces and community gatherings. as such, the building’s plan is organized around a central courtyard, an outdoor activity center. in this way, the building’s life-force stems from a constantly activated central plaza around which all other programs play out. at the same time, traffic flow and internal-external space transformations unfold around this courtyard. 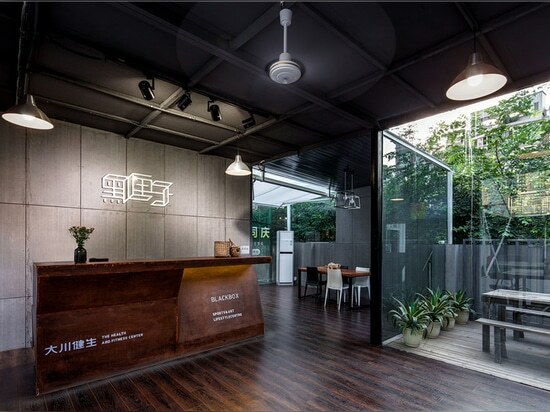 mostly defined by metal and concrete, epos architects and HAD have used the interior design to their advantage in distinguishing space. corrugated metal sheets and generous glass panelling adorn the upper mezzanine, with wooden floored meeting rooms bracketed by floor to ceiling windows. 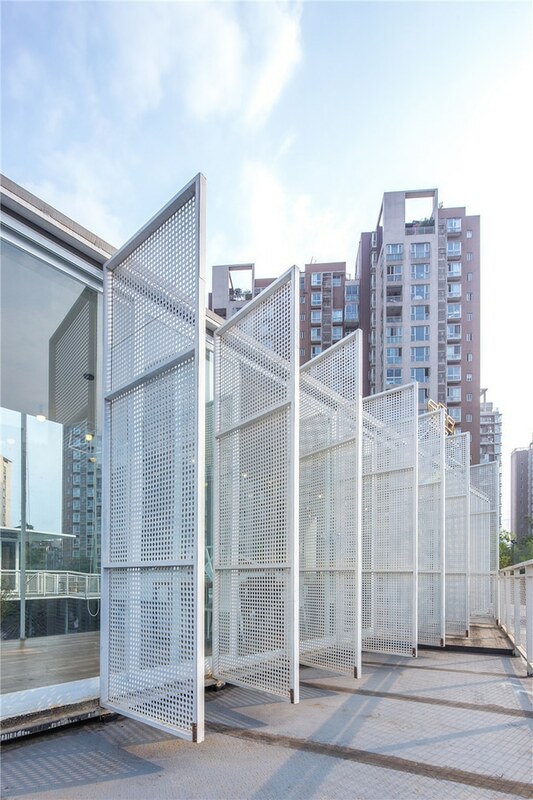 perforated steel sheets are hinged to the volume’s frames to create a textured and adaptable skin for the various boxes. 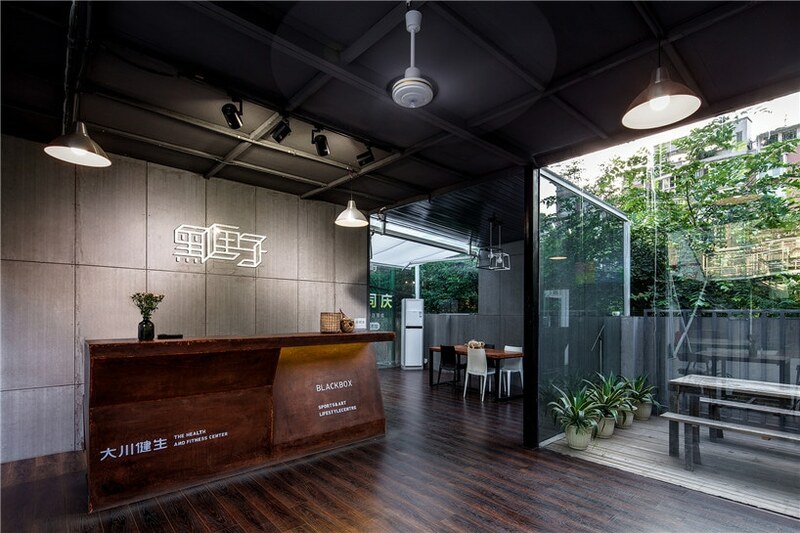 the gym’s reception area is clad in wood and black metal, with a rusted steel desk lending strength to the overall industrial and up-cycled aesthetic. event spaces and conference rooms are likewise clad in wood, adding a mature and warm aspect to the structure that connects to the project as a whole through use of glass windows. 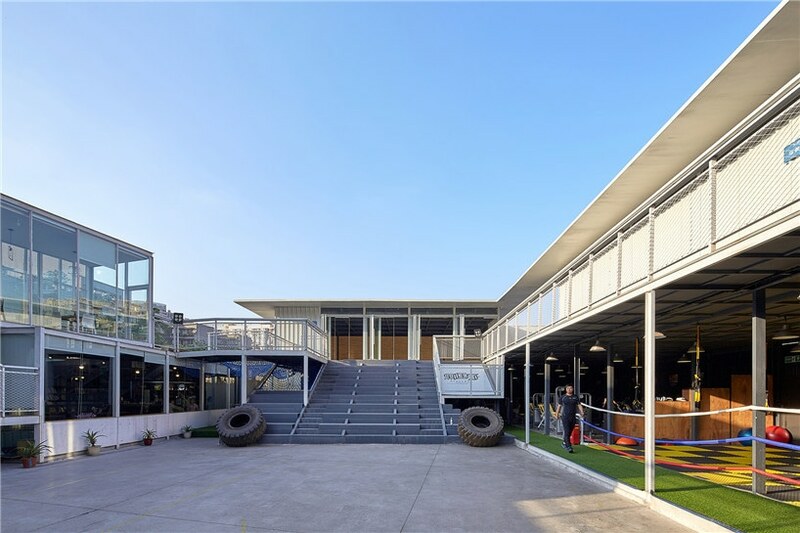 due to the project’s multiple and contrasting programs, the architects consciously determined the building’s philosophy as ‘not defined’, allowing the black box gym to simply serve as a low-cost, temporary resource for the community.